The PADI Digital Underwater Photographer course gets you started quickly with today’s modern digital equipment, whether you use a point-and-shoot snap camera or a sophisticated D-SLR like the pros. The course consists of two dives. The first dive can be conducted in a swimming pool, confined water or open water. 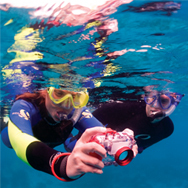 If you have completed the Digital Underwater Photography dive as part of the Adventures in Diving program that dive may count as the first dive of this course.